An efficient and effective campaign requires values-driven and inclusive decision making. Leading Campaign has been designed to help politicians, community leaders, and leaders of civil society organizations to analyze their organizational needs, create a shared purpose around core values, and achieve results. The course focuses on identifying solutions by analyzing existing adaptive problems. The course is designed for 6 to 8 weeks. Stories are critical to successful leadership, whether in the public, business, or social spheres. They provide you with simple yet powerful ways to connect with each other and tackle the most challenging issues together. Crafting a narrative is a leadership skill that enables you to listen to your inner calling, empathize with key stakeholders, and act collectively on an adaptive challenge. The leadership journey becomes uniquely powerful because it builds on shared values and emotions. You and your team gain the courage, compassion, and commitment to lead together during times of uncertainty. Leading with Your Story will create your public narrative that comprises of three parts: Story of Self to connect yourself with your team; Story of Us to connect your team members with each other; and Story of Now to mobilize your team to a call to action. This is a 1-day long course. Leading Collective Action is designed to strengthen the leadership capacity of community-based change-makers so that they can accelerate the impact of their innovations in their communities. The course coaches you to build intentional relationships as the foundation of purposeful collective action. It teaches you to articulate a story of why you and your constituency must take urgent action. In the lab set-up, you learn to: create strategies for turning your resources into the power needed to achieve clear goals; translate strategy into measurable, motivational, and effective actions; and structure your team with the shared purpose, norms, and roles for effective leadership. 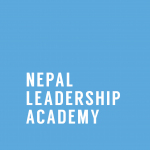 Nepal Leadership Academy (NLA) is a non-profit company established to help address the growing issue of leadership crisis around the world. Based on extensive experience with conducting leadership courses in the U.S. and Nepal, NLA offers customized leadership courses for young change-agents, aspiring entrepreneurs, and executive professionals from various sectors to architect effective policy, business, and civic solutions that tackle grueling adaptive challenges.